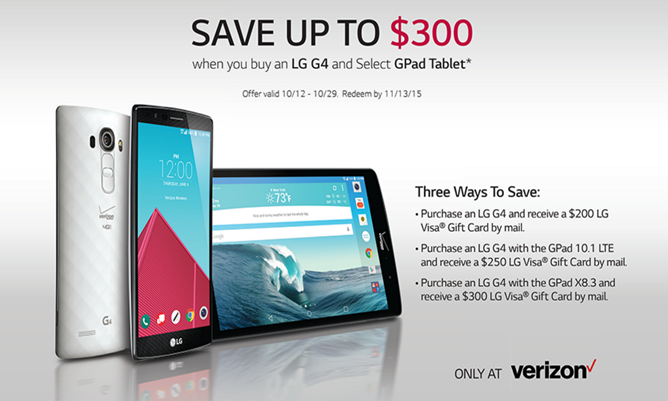 Use the promo code "LGG4SAVE" to take $100 off of a new G4 from Verizon's online store or mention it at a retail store. This drops the current price from $552 for the 32GB to $452. This promotion expires on November 14th. Note: this code doesn't seem to work if you buy the phone outright; you have to select the payment plan. It works out the same after two years; $23x24 before the discount, $18.83x24 after. OPTIONAL: Buy an LG G-Pad 10.1 ($299.99) or G-Pad X 8.3 ($299.99) from Verizon. You can buy these outright or use the payment plan, it doesn't matter. Once you have your phone, submit the Verizon-LG rebate for m on LGG4OctoberRebate.com with the information for your phone, and your tablet if you bought one. You must buy both the phone and tablet before October 29th and submit the rebate form before November 13th. You'll get a $200 Visa prepaid card for the phone alone, for a total savings of $300 and a final price of $252 - a fantastic deal on a brand new flagship device. If you bought the G-Pad 10, you'll get an extra $50 on the card (final price $502 for both the phone and tablet, total savings $350) and if you bought the G-Pad X 8.3 you'll get an extra $100 (final price $452, total savings $400). These are some awesome discounts, even if you don't take advantage of the tablet combo. And if you do, you can always remove the tablet from your account and give it to another Verizon user (or not - they'll still work as Wi-Fi tablets, after all). The holidays are coming up, and this looks like a good opportunity to score an LTE tablet on the cheap. If you want to take even more off of that price, you could try your luck with Verizon's phone trade-in system, though those rebates come in the form of a Verizon bill credit.